Different diagnostic techniques are used to increase sensitivity and specificity of diagnosis with less invasiveness to the patient. One such technique is high-frequency/high-resolution ultrasound (HFUS/HRUS), which provides good discrimination of the different cutaneous layers without secondary effects (Wortsman and Wortsman, J Am Acad Dermatol 62:247–256, 2010). Ultrasound imaging was first proposed as a tool for dermatologist in the late 1970s and first applied to skin cancer diagnosis in the 1980s (Kleinerman et al., J Am Acad Dermatol 67:478–487, 2012; Hoffmann et al., Z Hautkr 64(10):851–852, 1989; Hoffmann et al., Hautarzt 41(6):333–339, 1990). HFUS/HRUS provides specific patterns that can be deduced from images to diagnose certain dermatologic conditions and characterize their behavior (Wortsman and Wortsman, J Am Acad Dermatol 62:247–256, 2010; Desai et al., Dermatol Surg 33:1220–1227, 2007). It is an adjuvant in the diagnosis of skin lesions (Wortsman and Wortsman, J Am Acad Dermatol 62:247–256, 2010), and its use in the study of skin carcinomas is helping dermatologist in therapeutic decision making. 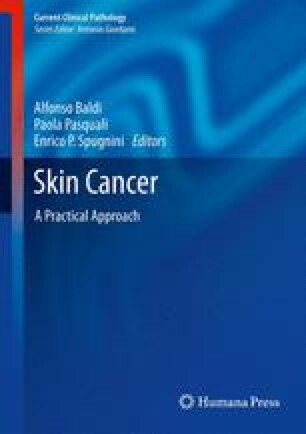 This chapter deals on the use of HFUS/HRUS in the management of basal cell carcinomas (BCC).